If you’re ever near the North or South Pole, you may be in for a very special treat. Frequently there are beautiful light shows in the sky. These lights are called auroras. If you’re near the North Pole, it is called an aurora borealis or northern lights. 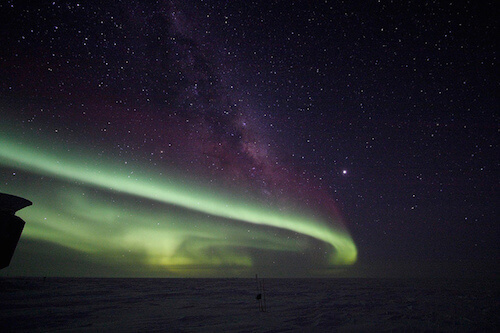 If you’re near the South Pole, it is called an aurora australis or the southern lights. 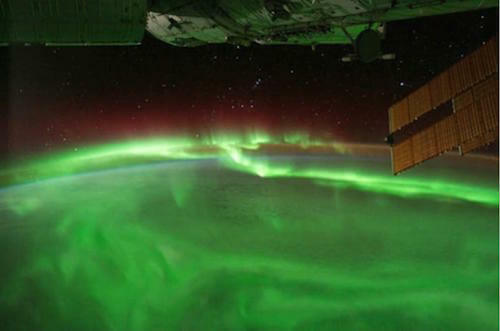 This beautiful view of the aurora was taken from the International Space Station as it crossed over the southern Indian Ocean on September 17, 2011. Even though auroras are best seen at night, they are actually caused by the sun. The sun sends us more than heat and light; it sends lots of other energy and small particles our way. The protective magnetic field around Earth shields us from most of the energy and particles, and we don’t even notice them. 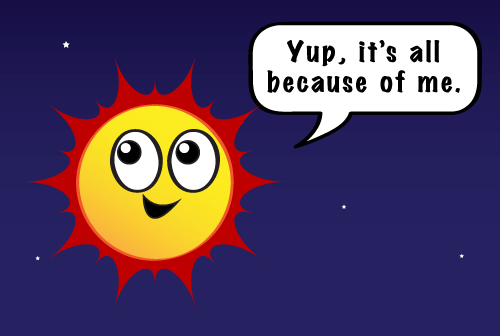 But the sun doesn’t send the same amount of energy all the time. There is a constant streaming solar wind and there are also solar storms. 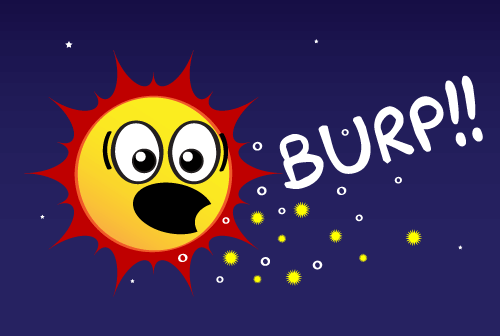 During one kind of solar storm called a coronal mass ejection, the sun burps out a huge bubble of electrified gas that can travel through space at high speeds. 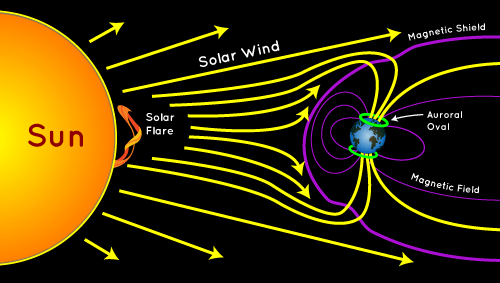 When a solar storm comes toward us, some of the energy and small particles can travel down the magnetic field lines at the north and south poles into Earth’s atmosphere. There, the particles interact with gases in our atmosphere resulting in beautiful displays of light in the sky. Oxygen gives off green and red light. Nitrogen glows blue and purple. Do other planets get auroras? They sure do! Auroras are not just something that happen on Earth. If a planet has an atmosphere and magnetic field, they probably have auroras. We’ve seen amazing auroras on Jupiter and Saturn. 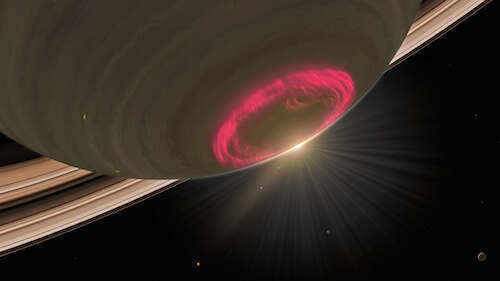 These swirls of red light are an aurora on the south pole of Saturn. Image courtesy of NASA/ESA/STScI/A. Schaller. 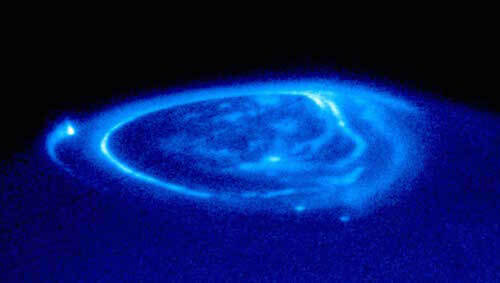 The NASA Hubble Space Telescope took this picture of an aurora on Jupiter using ultraviolet (UV) light. How old is the sun?